Deputy Prime Minister Dmitry Rogozin called for more control in hazardous waste management in the Arctic. He gave this directive at a meeting of the State Commission for Arctic Development. Arctic.ru has published a report by the Chair of the Council of Young Scientists of the North, Presidium Member of the Arctic Public Academy of Sciences, Arseny Mitko, on nuclear threats in northern seas and the potential dangers and risks they may hide. The issues of sustainable development of humanity and environmental protection bring to the light the particularly vulnerable polar areas of our planet like the Arctic. Unlike the carefully held Antarctic, the Arctic is under intense development. Manmade impact on the Arctic has increased dramatically in recent decades due to the search for and development of new oil and gas fields on the continental shelf, but also because of the heightened interest in its mineral resources. Since the late 1970s, the world community began to pay increased attention to the preservation of the Arctic. In 1991 in Rovaniemi, at the initiative of Finland, eight countries in the Arctic region (Denmark with sovereign Greenland, Iceland, Canada, Norway, Russia, the US, Finland and Sweden) signed an agreement on a strategy for the protection of the natural Arctic environment. The objectives of this strategy include protection of Arctic ecosystems, including manmade, protection and recovery of the environment, the application of the established rules of natural resource use, and recognition of the traditions and cultural needs of the indigenous peoples of the North. The increasing economic and political role of the Arctic has led to the growth of environmental concerns, one of which is potentially dangerous underwater objects, hidden for many years at the bottom of the Arctic seas. These include toxic chemicals, ammunition and explosives dumped during and after World War II, as well as the contamination of water areas with radioactive substances. In the last 15-20 years, the world community has been concerned about events associated with the consequences of the nuclear arms race, which caused some damage to the ecology of the Arctic. Radioactive contamination has occurred in certain areas from the dumping of radioactive, potentially environmentally hazardous solid waste which settled on the seabed and existed there up to now, including decommissioned and sunken nuclear-powered submarines (NPS). In 1957-1992 in the Arctic (in the Barents and Kara seas), liquid and solid radioactive waste (LRW, SRW) disposal was carried out by the Soviet Union (and its successor Russia). © RIA Novosti. Vitaly Ankov. Accident mitigation exercises at a hazardous radiation facility. It is worth mentioning that technogenic radionuclides, discharged from Russian nuclear centres (Mayak Production Association, Siberian chemical plant, and Krasnoyarsk-26), hardly influenced radioactivity levels in the Arctic seas. Because of the enormous length of the Yenisei, Irtysh and Ob rivers, technogenic radionuclides mainly settled in the floodplains of these great Arctic rivers, as well as in estuarine sediments (the so-called marginal filter of the ocean), and require careful attention. For example, cessation of atmospheric nuclear tests led to a reduction in radioactive contamination of the surrounding atmosphere at sites, where sea and river waters meet and a rapid fallout of suspended matter takes place. There are no dangerous consequences of LRW discharge, which was discontinued by Russia in the Arctic in 1992 (in the Sea of Japan — in 1993). At the same time, a continuing source of contamination, other than global fallout, is the radioactive waste removal from Western European radiochemical plants for spent nuclear fuel treatment. If cuts in waste discharges from radiochemical plants lead to a real technogenic load reduction for the Arctic region, the presence of Soviet/Russian abandoned and sunken submarines and SRW in the northwestern Arctic is a potential hazard, which increases for some objects every year and can exist for dozens and hundreds of years. Currently, on the seabed of the northwestern Arctic there are about 18,000 objects with various degree of radiation hazard, which sank during the Cold War and which contain radioactive waste from the operation of nuclear submarines of the Northern and icebreaker fleets. Seven of the radiation "heritage" objects contain fission byproducts, which are part of spent nuclear fuel (SNF) on enriched uranium, and can be classified as a nuclear hazard. 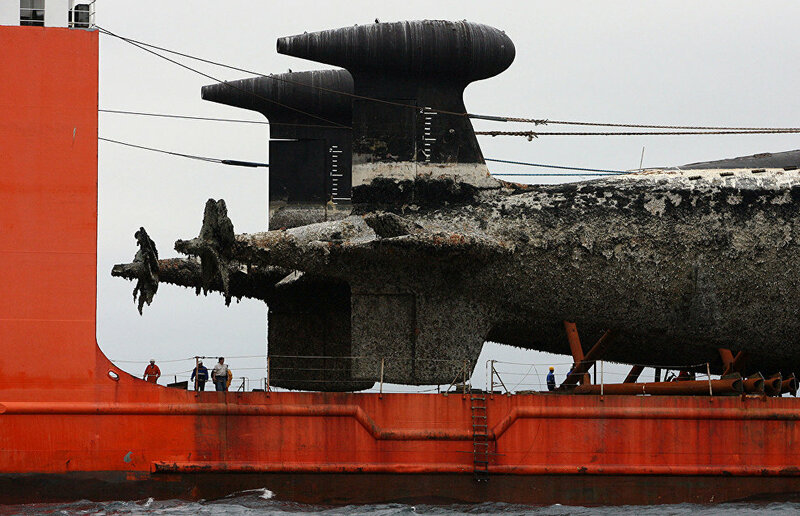 First, there are three submarines, one of which (K-27 with two naval nuclear reactors that used a liquid-metal coolant) was scuttled in 1981 in Stepovoy Bay on the eastern coast of Novaya Zemlya. Two other submarines sank as a result of an accident: K-278 (Komsomolets) — in 1989 in the Norwegian Sea, K-159 — in 2003 in the Barents Sea. Moreover, in the 1960s, in the bays on the eastern coast of Novaya Zemlya, five reactor compartments with naval nuclear power systems were dumped, two of which contain spent nuclear fuel and a screen container assembly with some SNF from one of the reactors of the Lenin nuclear icebreaker. A barge with a damaged reactor containing spent nuclear fuel, unloaded from nuclear submarines (order No. 421), was scuttled in Novaya Zemlya hollow of the Kara Sea. The scuttled reactors with SNF from nuclear submarines and the container with SNF from the Lenin icebreaker, which were fixed on a barge and a pontoon before sinking, will be the first to reach the bottom. At the same time, in Abrosimov and Stepovoy bays (the Novaya Zemlya Archipelago) bottom sediment was found to contain technogenic radionuclides due to the scuttled SRW located in close proximity to these objects. The total collective dose from seafood consumption from the Barents Sea is 3-5 mSv (millisievert) per year, fish consumption is the largest contributor (93 percent). The percent of other seafood types is much smaller: crustaceans — about 4 percent, seaweed — approximately 1.7 percent, mollusks — about 1.4 percent, and sea mammals — about 0.3 percent. Of all radionuclides, Cesium-137 (137Cs) is the largest contributor from seafood consumption. Compared to the Barents Sea, the collective dose from Kara Sea seafood consumption is much lower (about 0.03 mSV per year) due to lower productivity and a smaller number of critical population groups. © RIA Novosti. Installing a detail on the RITM-200 reactor for the lead nuclear icebreaker Arktika, under the 22220 project. In general, the available data allowed the experts to conclude that the technogenic irradiation level of Arctic hydrobionts, including through scuttled SRW, is very low and may not be a significant source of radio-ecological risk. Long-term radiation monitoring allowed a Norwegian-Russian expert group and IAEA experts to evaluate the impact of the radioactive pollution on the environment. They came to the conclusion that the scuttled radioactive waste should remain at the sea bottom, but regular inspections are necessary to detect possible changes in the situation. In addition, it is important to distinguish between SNF and SRW. SRW activity decreases from year to year due to radioactive decay, as a result, its real and potential danger in the end will be negligible. In contrast, the SNF decay period is very long (hundreds and thousands of years), as in the addition to the radioactive decay of some radionuclides, at the same time there is formation and accumulation of other radionuclides. As gradual degradation of structural elements of scuttled and sunken reactors with spent nuclear fuel (nuclear submarines, reactor compartments, reactors) is accompanied by an increase in potential hazards, which will eventually transform into the real hazards, we or our descendants will have to deal with the lifting and disposing of these nuclear-hazardous objects. All of this makes the task of cleaning (recovery) of the seas from scuttled and sunken potentially dangerous nuclear facilities particularly relevant. An illustrative example of a positive approach to solving this problem is the lifting of the Kursk nuclear submarine, which sank as a result of an accident. The raising was carried out by the Dutch company Mammut in 2002. The modern technology of raising heavy objects from the sea bottom inspires confidence in the possibility of rehabilitating the sea areas polluted with radioactive waste, as a consequence of the operation of Russian naval reactors. The same approach can be used for raising other sunken nuclear submarines from Russia and the US. Unfortunately, this international activity is extremely time-consuming, requires large financial investment, the good will from governments of the economically developed countries of Europe and America, public support for reducing the threats posed by nuclear and radioactive objects in the Oceans, the creation of new ethical and environmental standards and rules for the relationship between man and the biosphere. Analysis of main international agreements, of national regulations indicates that no violations took place in relation to the radioactive waste disposal left after the operation of the Soviet/Russian nuclear fleet in the Arctic region prior to 1991. The amount of radioactive waste, dumped by the USSR/Russia, is smaller than the current radioactive waste discharges by British and French radiochemical plants, which are the main ongoing sources of radioactive pollution in the western Arctic seas. © RIA Novosti. Vitaly Ankov. Docked nuclear missile submarines. None of the international agreements, national standards or regulations call for the reclamation of sea areas, nor formulate any requirements for it. However, the broad interpretation of the main provisions of these documents does not exclude an opportunity to implement such reclamation by mutual agreement of the parties concerned. Field studies indicate that currently these objects do not pose a real radio-ecological threat to the population or the environment. However, some, especially those containing spent nuclear fuel, should be considered sources of potential danger, the extent and consequences of which will depend on protective barriers that separate the radioactive substances from the sea environment, on mechanisms of their transfer (transboundary transfer is not excluded) in water, on their impact on biota and humans. Presence of a large number of objects, containing spent nuclear fuel and radioactive waste on the seabed of a unique natural region like the Arctic basin, without a comprehensive program for future treatment and systematic radio-ecological monitoring, is unacceptable from both the environmental and ethical points of view. The presence of nuclear materials in almost uncontrollable conditions in the shallow areas in the seas makes this problem even more urgent because of the terrorist threat. Full rehabilitation of sea waters by raising sunken objects, let alone reburial of nuclear and radiation hazardous objects, is inexpedient and economically unfeasible from the radio-ecological point of view. Moreover, reburial is unwarrantable under Russia's international obligations. In these circumstances, for the sake of finding practical solutions to the potential environmental threat posed by scuttled and sunken Soviet/Russian objects in the Arctic seas during the Cold War, it is necessary to develop a comprehensive program for lifting all of the objects with spent nuclear fuel, including nuclear submarines.